A phinisi is a traditional Indonesian two masted sailing vessel whose design is said to have been copied from the Dutch pinnace vessels which were used in the area by the Dutch East Indies Company around 1600. Phinisis are still being built to this day by the Konjos tribesmen on the beaches of South Sulawesi using iron wood and teak and rudimentary tools. And so it was on 15th February 2012 and following 400 years of tradition; The Carpe Diem Phinisi began to become the beautiful vessel that you see today. August 2014. All finished ready to set sail. As the Carpe Diem is specifically designed and operated for small groups of passengers, there are only four cabins for our guests. This limits of our maximum number of guests 10. Each cabin is ensuite with a shower, sink and toilet and each cabin has an individual air conditioner. All cabins have a desk and chair and ample storage space. Meticulous attention has been paid to the cabin design and aesthetics in order to provide a beautiful, warm ambiance for our guests. The Pala cabin is large double cabin on the Main Deck level spanning almost the entire width of the boat. The cabin is adorned with large forward facing windows and a skylight. The Pala cabin has en-suite separate shower and bathroom. This cabin is also equipped with an individually controlled air conditioning unit. The Cengkeh cabin is on the lower deck and can be used as either a twin cabin or a double cabin as the twin single beds have been especially designed to be joined to form a comfortable double bed. The cabin is also equipped with an individually controlled air conditioning unit. Natural light and natural ventilation is provided by a porthole and a large skylight. This allows guests to switch off the individual air conditioning have have the cool sea breeze and gentle sounds of the ocean soothe them to sleep. This cabin is serviced by an en suite combined shower and toilet. These two cabins are also on the lower deck and are mirror images of each other and are capable of sleeping up to 3 guests in a double/single bunk bed configuration. These cabins can also be used for two single guests. These cabins are also equipped withindividual air conditioning unit. Natural light and natural ventilation is provided by a porthole and a skylight. This allows guests to switch off the air conditioning have have the cool sea breeze and gentle sounds of the ocean soothe them to sleep. These cabins are serviced by en suite combined shower and toilet. In the main deckhouse there is a well appointed saloon where guests can relax around the large 10 seater table. Meals may also be served here should weather conditions prevent alfresco dining. The saloon also houses the on board library containing numerous books for guests to enjoy. The large open deck space in front of the deckhouse is typically used for alfresco dining, chilling out and has been utilised as a yoga studio with unparalleled views. 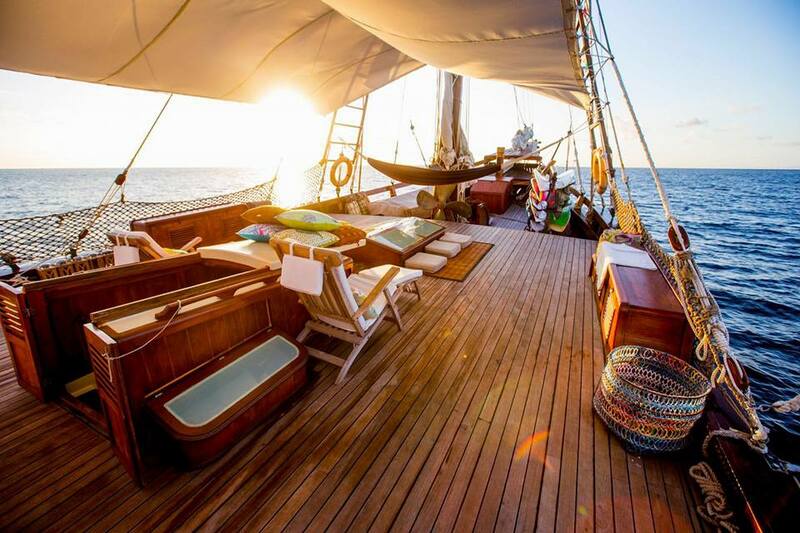 Whilst the deck space on top of the deckhouse is a great spot to simply relax and watch the world go by. We know how important food is to our guests. So we take the utmost care to ensure that you are not disappointed. From our locally sourced fresh ingredients, to our imaginative menus; all prepared by our wonderful Chef and overseen by Cecile who is French and therefore passionate about food. Sometimes we are lucky enough to meet up with local fishermen who offer us the freshest seafood you can imagine. We can also supply alcoholic drinks on request, simply let us know in advance or bring your own from Duty Free. Let us know if you have any special dietary needs and we will be sure to make sure that these are respected too.